This discussion was created from comments split from: Peggy 2 novice having problems with Peggy Draw 2. I have to note that we had to modify the board to use an UNO chip because the ATmega that came with it seemed to have gotten corrupted - The Uno was programing the examples from the Peggy 2 library with no problem. Here is what I get when I try to verfiy/upload the sketch I just finished in processing. Again any help would be awesome. Thanks! The error indicates that you do not have the Peggy 2 library for Arduino installed, so it's more of a failure-to-install-software fail, rather than a Peggy fail. Please download and install that library and restart Arduino before trying again. Maybe I have the Peggydraw_heartart in a wrong relationship to it? - thanks for your help and your answer on the animation possibilities. Yes, that installation looks correct; try restarting Arduino to see if it is installed correctly. If the library is installed correctly, you should see Peggy2 listed in your File>Examples menu within Arduino. 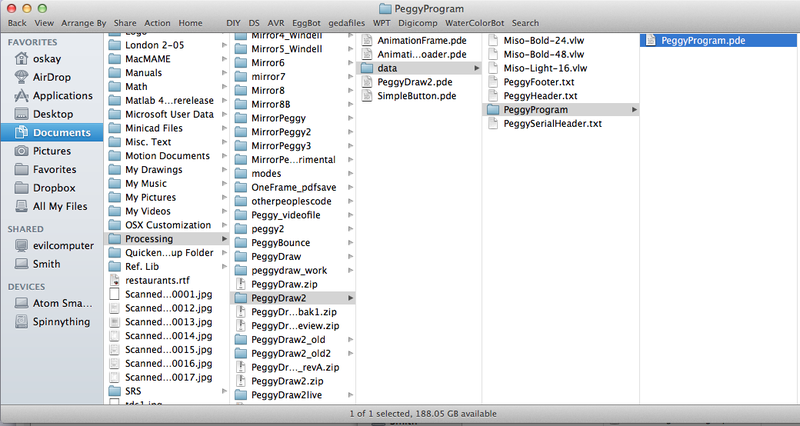 Yes, the Peggy2 File>Examples menu works fine and programs in (loads to the board) just fine. I spent some time this morning going through and loading all of them and doing simple mods to get a feel for the code and it uses. The Peggydraw however and the Peggydraw_heartart both still are showing the same errors - I want to try to get my own content on here with it... which... will happen eventually! Oh-- I see --I have made a mistake here, and I do apologize. I had mistaken the source of the "does not name a type" error, which almost always indicates that one of the Arduino libraries is not installed. However, that's not what's going on here. What's actually going on is that you've opened up the Processing application itself (PeggyDraw 2)-- not the output file that it created. When you save a file in PeggyDraw 2, it shows up in the data/PeggyProgram folder-- and *that* is the output that you should open with Arduino. Can you please paste the contents of the Peggy program? /* Simple example code for Peggy 2.0, using the Peggy2 library, version 0.2. Designed to be automatically generated! Copyright (c) 2008 Windell H Oskay. All right reserved. frame1.HardwareInit(); // Call this once to init the hardware. Thanks again Evil Genius you! Fresh v1.1 for fresh code! Word! Okay-- great! And, again, my apology for not catching that initial error correctly the first time. No worries man! Thanks for all your help! One more question, I'd really love to do more with programming in variable shades, I know you briefly touched on that in the other thread you split my questions into, do you have any suggestions for places/resources to study up on doing that? The Peggy 2 hardware-- natively --only knows about on and off. However, the refresh rate is very high, so we can simulate multiple brightness levels by trading off refresh rate, and lighting some of the LEDs for only part of the time-- quite convincingly to the eye. We show off this capability in a few of the demo programs, and also use it in the "Peggy 2 video" examples, where we let the Peggy 2 receive serial-streamed data with 16 levels of brightness. You might want to look at those examples as a starting point. For PeggyDraw 2, we wanted to make it simple to use and able to draw a lot of frames (~250), so it's single-level on/off. If we rewrote it to use 16 grayscale levels, that would requires four times as much memory (4 bits per LED), so only 1/4 as many frames could be stored in memory, or about 60 frames maximum. Perhaps 8 gray levels (3 bits per LED) would be a better choice, giving about 120 frames available.